Solid Vision are interactive holographic projections. Seto Kaiba used this phenomenon to create holographic monsters in order to recreate the Experience of Death Penalty Game and enhance games, including Duel Monsters, Dungeon Dice Monsters and Capsule Monster Chess. Duel Monsters cards contain microchips. When the cards are played in a Battle Box, Dueling Arena, Duel Disk or Duel Runner, the microchip is activated. The data it contains is used to created the Solid Vision holograms. There are also certain situations where the holograms can inflict real damage. Two years before the events of the series, Seto Kaiba designed the prototypes for the Solid Vision system during Gozaburo Kaiba's time as CEO of KaibaCorp. He intended to use them in his plans for Kaiba Land, but Gozaburo re-purposed the system as a tool for battle simulations. After taking over KaibaCorp, Kaiba took his ideas to Maximillion Pegasus, who discussed them with him during his match with Bandit Keith. KaibaCorp and Industrial Illusions came to a deal to produce the Duel Arenas. Around the same time, Zigfried von Schroeder had been designing Battle Boxes, a similar system, but Pegasus made his deal with Kaiba just as Zigfried arrived on the scene. Kaiba continued to develop the system. After his loss to Yugi Muto, he created two prototype Duel Disks which would both allow him to Duel in any location using Solid Vision and also project holographic cards to help obscure the user's faces; a tactic that Kaiba thought would help him combat Pegasus's apparent mind-reading. He perfected this design with the Mark II Duel Disk. The organization Paradius appeared to have gained early access to the system; Dartz was shown giving Rafael and Valon Chaos Duel Disks prior to the events of the series. In Yu-Gi-Oh! 5D's, Solid Vision is also used to play Duel Monsters on Duel Runners. The stadiums project holographic "spheres" that can display images of Turbo Duels, in order to allow spectators to easily observe the Duels while they are motion. Solid Vision is not used in Yu-Gi-Oh! ZEXAL. Instead, a new system, called AR Vision is used in conjunction with the Duel Gazer and the new model of Duel Disks, which can only be seen by a person if they wear a Duel Gazer. In Yu-Gi-Oh! ARC-V, Solid Vision has been developed into the ARC (Augmented Reality Combat) System (Real Solid Vision in the Japanese version), described as "Solid Vision with mass", by a collaboration between Leo Akaba and Yusho Sakaki. The former founded the Leo Corporation to mass produce the system for the general public, leading to the creation of Action Duels. The system produces holograms that can be touched and deal physical blows, though the power and hardness of the Solid Vision can be adjusted for younger users. It is only used in Action Duels at the start of the series, though the Duel Disks project a source as a blade, and when the ARC System is damaged, the Duel ends. The ARC System can also be applied to Duel Disks, allowing it to be used outside of an Action Field. It is widely used by Duel Academy, The Resistance (who may have reverse-engineered the technology) and Sector Security, who were given the technology by Jean-Michel Roget. Sector Security use the ARC System for a wider variety of purposes; energy nets projected by blasters, and projections of "Gate Blocker" to bar exits. According to Leo Akaba, the ARC System was discovered in the Original Dimension and it lead that Dimension's ruin. Monsters produced with the ARC System become self-aware, as Duel Monsters have souls. This caused a duelist and his four dragons to go in a rampage and merge into a single dragon. In Yu-Gi-Oh! VRAINS, outdated Duel Disks that use physical cards materialize the blade of Solid Vision as the Duel Disks in ARC-V did. Solid Vision holograms do not inflict physical damage. After his Shadow Game with Dark Yugi, where the summoned monsters became real and Kaiba was subjected to the Experience of Death Penalty Game, Kaiba created Battle Boxes which used Solid Vision to enhance Duel Monsters and Capsule Monster Chess. He planned to make a deal with Industrial Illusions to produce them. During Maximillion J. Pegasus's match with Bandit Keith, Kaiba was given a front-row seat. Pegasus handed the Duel over to to a boy in the crowd, Tom, and sat with Kaiba. Apparently reading his mind, he stated that he had taken a look at Kaiba's proposal and loved the idea of the Battle Boxes, proposing that they would make it a reality and that he'd be in touch. During Death-T, Kaiba used Solid Vision for a variety of purposes; projecting his image within the Haunted Houses, and within the Battle Boxes, to create holograms of the monsters Summoned in Duel Monsters and Capsule Monster Chess. Whoever lost a game would be subjected to a Solid Vision recreation of the Experience of Death. He tested the Penalty Game on human subjects, finding that the average person went insane after ten minutes of the torture. Battle Boxes were also used for the Regional and Duelist Kingdom tournaments. To combat Pegasus' mind reading, Kaiba used Solid Vision to create Duel Disks to play Duel Monsters with, intending to hide his face. However, Pegasus refused to use the system unless Mokuba operated it as a proxy. Kaiba further refined this system, creating a superior Duel Disk for use in the Battle City tournament. In Yu-Gi-Oh! The Dark Side of Dimensions, Kaiba Corporation develops a new Duel Disk, which creates Solid Vision holograms from images in the user's brain. He also appears to have created similar systems to the ARC System; while it is unclear if his holograms can inflict damage during Duels, his technology can create paths from thin air and dematerialize them. Solid Vision is not used in Yu-Gi-Oh! ZEXAL. Instead, a new system, called AR Vision is used in conjunction with the D-Gazer and the D-Pad, which can only be seen by a person if they wear a Duel Gazer. 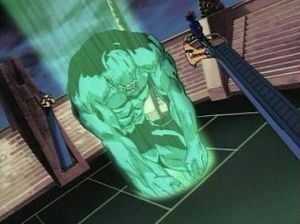 An example of a DDM monster Summoned with Solid Vision in a Dueling Arena. An example of a Duel Monsters monster Summoned with Solid Vision in a Duel Disk. An example of a Duel Monsters monster summoned with Solid Vision in a D-Pad. An example of a Duel Monsters Field Spell Card activated in a Duel Disk. A Battle Box as seen in the manga. A Dueling Arena as seen in the anime. The first Duel Disk model created by Kaiba. The second Duel Disk model created by Kaiba. A basic Duel Runner model made by Yusei Fudo. A standard D-Pad used in the ZEXAL series. A standard Duel Disk used in the ARC-V series. The third Duel Disk model created by Kaiba. Kazuki Takahashi explained in an interview in Duel Art that Solid Vision was inspired by the holographic Dejarik board from Star Wars Episode IV: A New Hope. ↑ Yu-Gi-Oh! Duel 27: "Project Start!" This page was last edited on 20 September 2018, at 15:32.